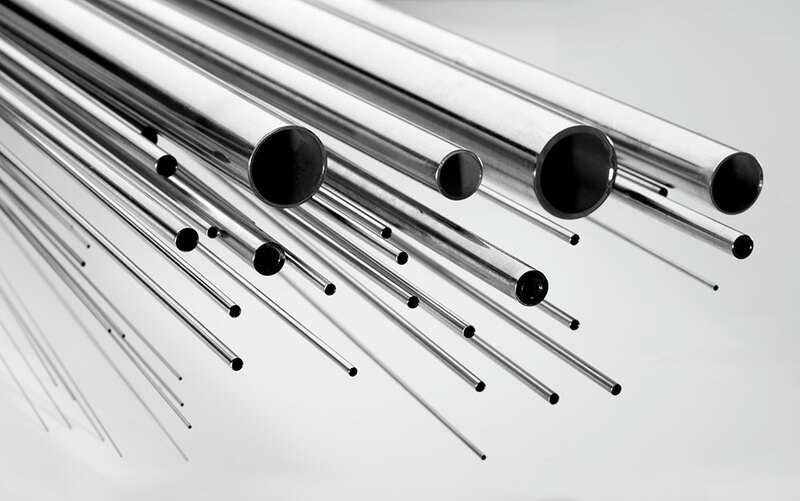 MicroGroup Fractional tubing is often used in commercial applications that require corrosion resistance and material strength. MicroGroup fractional tubing starts at 1/32″ OD and is generally stocked in 304 stainless steel and 316 stainless steel but is also available in many other metals and alloys in a variety of specifications. It is typically stocked in the annealed temper condition and is available as welded tubing (welded and drawn) or seamless tubing. For more information about sizes or alloys not listed below call 800-All-TUBE and speak with one of our All-Tube Sales Representatives. 0.006 0.02 0.0263 0.0363 0.005 0.007 304 1/32"
0.01 0.042 0.0575 0.0675 0.009 0.012 304 1/16"
0.016 0.03 0.0575 0.0675 0.014 0.018 304 1/16"
0.01 0.073 0.0888 0.0988 0.009 0.012 304 3/32"
0.016 0.061 0.0888 0.0988 0.014 0.018 304 3/32"
0.02 0.053 0.0888 0.0988 0.017 0.023 304 3/32"
0.028 0.037 0.0888 0.0988 0.024 0.032 304 3/32"
0.035 0.023 0.0888 0.0988 0.03 0.04 304 3/32"
0.006 0.113 0.12 0.13 0.005 0.007 304 1/8"
0.01 0.105 0.12 0.13 0.009 0.012 304 1/8"
0.012 0.101 0.12 0.13 0.01 0.014 304 1/8"
0.016 0.093 0.12 0.13 0.014 0.018 304 1/8"
0.02 0.085 0.12 0.13 0.017 0.023 304 1/8"
0.028 0.069 0.12 0.13 0.024 0.032 304 1/8"
0.035 0.055 0.12 0.13 0.03 0.04 304 1/8"
0.006 0.144 0.1513 0.1613 0.005 0.007 304 5/32"
0.01 0.136 0.1513 0.1613 0.009 0.012 304 5/32"
0.016 0.124 0.1513 0.1613 0.014 0.018 304 5/32"
0.02 0.116 0.1513 0.1613 0.017 0.023 304 5/32"
0.028 0.0991 0.1513 0.1613 0.024 0.032 304 5/32"
0.035 0.086 0.1513 0.1613 0.03 0.04 304 5/32"
0.049 0.058 0.1513 0.1613 0.042 0.056 304 5/32"
0.006 0.176 0.1825 0.1925 0.005 0.007 304 3/16"
0.01 0.168 0.1825 0.1925 0.009 0.012 304 3/16"
0.016 0.156 0.1825 0.1925 0.014 0.018 304 3/16"
0.02 0.148 0.1825 0.1925 0.017 0.023 304 3/16"
0.028 0.132 0.1825 0.1925 0.024 0.032 304 3/16"
0.035 0.118 0.1825 0.1925 0.03 0.04 304 3/16"
0.049 0.09 0.1825 0.1925 0.042 0.056 304 3/16"
0.065 0.058 0.1825 0.1925 0.055 0.075 304 3/16"
0.006 0.207 0.2138 0.2238 0.005 0.007 304 7/32"
0.016 0.187 0.2138 0.2238 0.014 0.018 304 7/32"
0.035 0.149 0.2138 0.2238 0.03 0.04 304 7/32"
0.01 0.23 0.245 0.255 0.009 0.012 304 1/4"
0.016 0.218 0.245 0.255 0.014 0.018 304 1/4"
0.02 0.21 0.245 0.255 0.017 0.023 304 1/4"
0.028 0.194 0.245 0.255 0.024 0.032 304 1/4"
0.035 0.18 0.245 0.255 0.03 0.04 304 1/4"
0.049 0.152 0.245 0.255 0.042 0.056 304 1/4"
0.065 0.12 0.245 0.255 0.055 0.075 304 1/4"
0.083 0.084 0.245 0.255 0.071 0.096 304 1/4"
0.095 0.06 0.245 0.255 0.081 0.109 304 1/4"
0.01 0.261 0.2763 0.2863 0.009 0.012 304 9/32"
0.02 0.241 0.2763 0.2863 0.017 0.023 304 9/32"
0.006 0.3 0.3075 0.3175 0.005 0.007 304 5/16"
0.01 0.292 0.3075 0.3175 0.009 0.012 304 5/16"
0.02 0.272 0.3075 0.3175 0.017 0.023 304 5/16"
0.028 0.272 0.3075 0.3175 0.024 0.032 304 5/16"
0.035 0.242 0.3075 0.3175 0.03 0.04 304 5/16"
0.065 0.182 0.3075 0.3175 0.055 0.075 304 5/16"
0.016 0.312 0.3388 0.3488 0.014 0.018 304 11/32"
0.035 0.274 0.3388 0.3488 0.03 0.04 304 11/32"
0.01 0.355 0.37 0.38 0.009 0.012 304 3/8"
0.021 0.335 0.37 0.38 0.018 0.023 304 3/8"
0.028 0.319 0.37 0.38 0.024 0.032 304 3/8"
0.035 0.305 0.37 0.38 0.03 0.04 304 3/8"
0.049 0.277 0.37 0.38 0.042 0.056 304 3/8"
0.01 0.417 0.4325 0.4425 0.009 0.012 304 7/16"
0.02 0.397 0.4325 0.4425 0.017 0.023 304 7/16"
0.028 0.381 0.4325 0.4425 0.024 0.032 304 7/16"
0.035 0.367 0.4325 0.4425 0.03 0.04 304 7/16"
0.049 0.339 0.4325 0.4425 0.042 0.056 304 7/16"
0.006 0.488 0.495 0.505 0.005 0.007 304 1/2"
0.02 0.46 0.495 0.505 0.018 0.022 304 1/2"
0.028 0.444 0.495 0.505 0.025 0.031 304 1/2"
0.035 0.43 0.495 0.505 0.032 0.039 304 1/2"
0.049 0.402 0.495 0.505 0.044 0.054 304 1/2"
0.065 0.37 0.495 0.505 0.059 0.072 304 1/2"
0.035 0.555 0.62 0.63 0.03 0.04 304 5/8"
0.01 0.042 0.0575 0.0675 0.009 0.012 316 1/16"
0.016 0.03 0.0575 0.0675 0.014 0.018 316 1/16"
0.01 0.073 0.0888 0.0988 0.009 0.012 316 3/32"
0.02 0.053 0.0888 0.0988 0.017 0.023 316 3/32"
0.01 0.105 0.12 0.13 0.009 0.012 316 1/8"
0.016 0.093 0.12 0.13 0.014 0.018 316 1/8"
0.02 0.085 0.12 0.13 0.017 0.023 316 1/8"
0.028 0.069 0.12 0.13 0.024 0.032 316 1/8"
0.035 0.055 0.12 0.13 0.03 0.04 316 1/8"
0.049 0.058 0.1513 0.1613 0.042 0.056 316 5/32"
0.006 0.176 0.1825 0.1925 0.005 0.007 316 3/16"
0.02 0.148 0.1825 0.1925 0.017 0.023 316 3/16"
0.028 0.132 0.1825 0.1925 0.024 0.032 316 3/16"
0.01 0.23 0.245 0.255 0.009 0.012 316 1/4"
0.02 0.21 0.245 0.255 0.017 0.023 316 1/4"
0.028 0.194 0.245 0.255 0.024 0.032 316 1/4"
0.035 0.18 0.245 0.255 0.03 0.04 316 1/4"
0.065 0.12 0.245 0.255 0.055 0.075 316 1/4"
0.016 0.249 0.2763 0.2863 0.014 0.018 316 9/32"
0.028 0.256 0.3075 0.3175 0.024 0.032 316 5/16"
0.02 0.46 0.495 0.505 0.018 0.022 316 1/2"
0.006 0.03 0.0575 0.0675 0.005 0.007 600 1/16"
0.01 0.042 0.0575 0.0675 0.009 0.012 600 1/16"
0.016 0.03 0.0575 0.0675 0.014 0.018 600 1/16"
0.02 0.03 0.0575 0.0675 0.017 0.023 600 1/16"
0.01 0.105 0.12 0.13 0.009 0.012 600 1/8"
0.016 0.093 0.12 0.13 0.014 0.018 600 1/8"
0.02 0.085 0.12 0.13 0.017 0.023 600 1/8"
0.01 0.23 0.245 0.255 0.009 0.012 600 1/4"
0.016 0.218 0.245 0.255 0.014 0.018 600 1/4"
0.02 0.21 0.245 0.255 0.017 0.023 600 1/4"
0.028 0.194 0.245 0.255 0.024 0.032 600 1/4"
0.035 0.18 0.245 0.255 0.03 0.04 600 1/4"
0.049 0.152 0.245 0.255 0.042 0.056 600 1/4"
0.065 0.12 0.245 0.255 0.055 0.075 600 1/4"
0.006 0.02 0.0263 0.0363 0.005 0.007 200 1/32"
0.01 0.042 0.0575 0.0675 0.009 0.012 200 1/16"
0.016 0.03 0.0575 0.0675 0.014 0.018 200 1/16"
0.02 0.03 0.0575 0.0675 0.017 0.023 200 1/16"
0.01 0.073 0.0888 0.0988 0.009 0.012 200 3/32"
0.02 0.053 0.0888 0.0988 0.017 0.023 200 3/32"